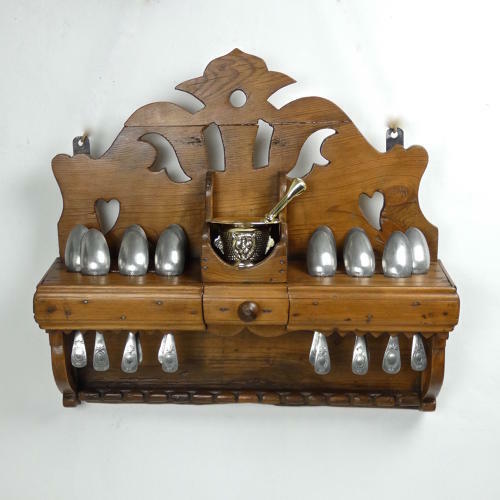 An unusual pine hanging shelf for displaying a mortar and pestle, and cutlery. The design of this piece contains carvings which are peculiar to Normandy, in Northern France and it dates from c.1850. It is dispalyed with 12 pewter spoons, which are contemporary with the shelf, and a brass pestle and mortar which would be later, from the first quarter of the 20th centruy. It is an excellent display piece and would work equally well in a kitchen or dining room. The shelf is carved in pine and has a small, central draw for salt. There are 18 slots in the top shelf, for cutlery, and a further 14 spaces at the bottom of the rack. We have displayed 12 mid 19th. century pewter spoons, 8 of one type and 4 slightly different. These can be seen in the other images. The small brass mortar and pestle would have been used mainly for grinding peppercorns. Across the top of the shelf you can see what looks like a crack in the wood but this is actually the way the piece has been made in sections. It is all in very good condition and we are selling it complete with spoons and mortar and pestle. Price includes postage within the U.K. Shipping to the U.S.A. add £50. Western Europe add £10.